A VIP annual membership is only $5.00. The maximum annual personal donation is $1,200. Donations of $250.00 or less are anonymous as far as Elections BC reporting requirements are concerned. Businesses and unions can no longer make donations.. You may become VIP Member at our meeting or by signing up on our website (www.VanIsleParty.com). 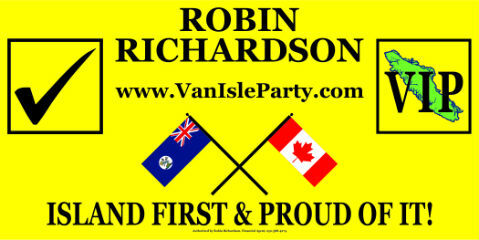 If you have friends/family/co-workers who would like more information about VIP, they can subscribe their email address on our website (www.VanIsleParty.com) to receive weekly messages from our Leader and other VIP members on topical issues of the day. For now, the existing tax credits for donations still apply. For a $100 donation, the donor gets a $75 tax credit for 2017 tax returns. Donations of $250 or less are anonymous as far as Elections BC reporting is concerned. Any donation of $1,000 or more gets a $500 tax credit. Businesses and unions may still make donations to the VIP before December 31.